From the sweat rolling into your eyes to the handful of "that was close" almost mishaps that you've had, your day is turning into one big hazard. Keep slippery hands and sweat trails from putting you at risk by gearing up with Black Stallion Men's 99ACE P ToolHand ... (see full details) (see specifications) #REV99ACE-P.
From the sweat rolling into your eyes to the handful of "that was close" almost mishaps that you've had, your day is turning into one big hazard. Keep slippery hands and sweat trails from putting you at risk by gearing up with Black Stallion Men's 99ACE P ToolHandz Sure Grip Blue Gloves. These Black Stallion gloves are fully loaded, down to the sweat wipes that help you keep the nasty wet stuff from dripping into your eyes. 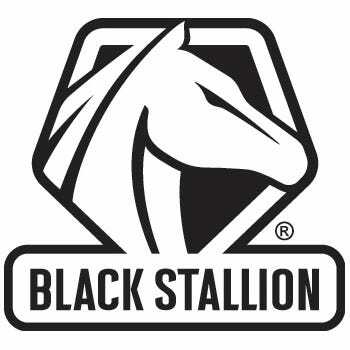 Black Stallion's innovative design also adds safety to your day with a better grip. Sure Grip technology delivers reinforced contact zones that offer superior traction. Resilient grain pigskin is what gives you this great grip, and you'll have superior extended general protection overall. The streamlined design of the men's gloves also features spandex backs to give you a snug, comfortable fit. The fast closures of these work accessories help you gear up and down quickly. For you to perform at your best, you need work gear that protects your assets. Black Stallion Men's 99ACE P ToolHandz Sure Grip Gloves protect your hands so you can work without the worry of hazardous distractions. I work at a lumber yard and load all sorts of material all day long. These gloves have worked with me for 2 years and I just lost one the other day, so buying a new pair. They are cheep enough to replace and they really work hard. I'm the 'get this stock boy' at my Dad's Hardware store. He don't have as good as gloves as these so I get my own. But my mom pays for them. But any ways, they grip good and I get no splinter from the wood or pipe shavings. Good for me, I like them. These Black Stallion gloves are classified as sure grip and are they ever. I love the fact that I can hold a wrench and it wont slip out of my hand. I also think they should be advertised as a sure fit because they mold right around my hand and wrap tight against my wrist and keep the glove in place for hours of work. Mechanic gloves are all the rage in the shop and sometimes you get what you pay for. When it comes to these Black Stallion gloves you get better then what you pay for. I love the fact that the palm and fingers are leather because it allows better gripping of the tools and the stretch backing breathes so I don't get sweaty hands. Black Stallion Gloves: Men's 99ACE P ToolHandz Sure Grip Blue Work Gloves is being added to your cart.